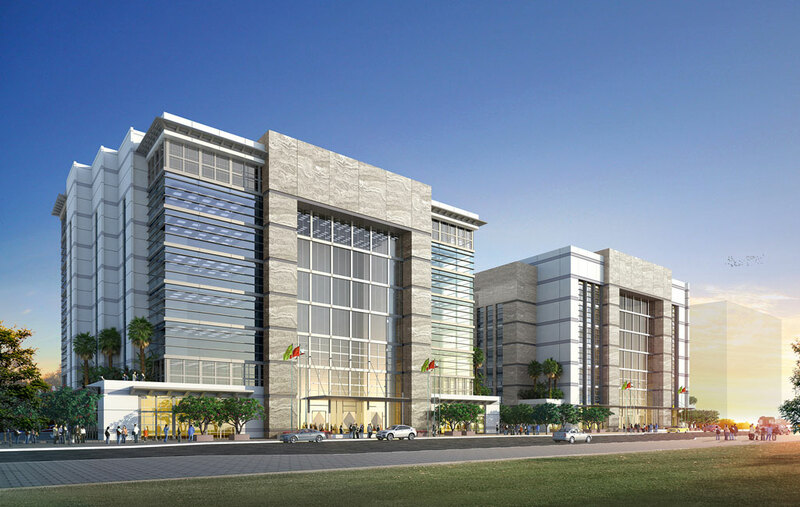 The Merchant Buildings is a design for two eight-storey office buildings in the Furjan master planned zone of Dubai that was produced for a private real estate developer. Designed in contemporary style, the articulated facades use composite aluminium cladding panels in two colours: silver grey and cream white. Ample glazing has been incorporated into the facade to ensure maximum penetration of light into the leased office space. The buildings are grounded on a granite clad plinth. The main entrance and all openings are protected by silver blades and fins, providing shade from direct sunlight. Typical office floors are designed to be highly practical and provide a degree of flexibility and freedom to subdivide the space into various sizes of commercial space. Circulation around the lift core and toilets is kept to a minimum to ensure maximum efficiency of the floor plate.